Almost 10 years ago (March, 2001) bought my own domain and found a host that seemed perfect for me. The domain name I finally chose, as you can see, is RemarkableTimes.com. Domain names back then could be acquired for as low as $9.99 per year with a two year minimum, is hasn't risen that much in 10 years! That, in my opinion, was a good deal. (See http://www.gkg.net.) 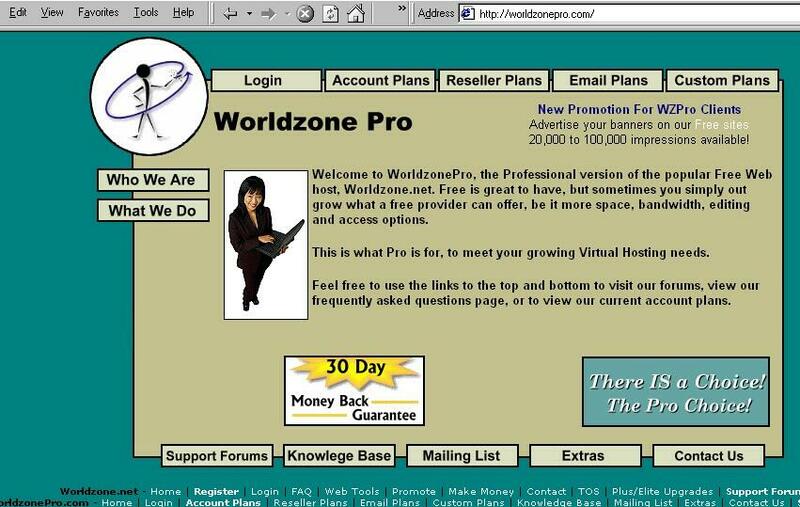 As for the host, I chose WorldzonePro.net, it had FTP capability (file transfer protocol) and gave me 120MB of space and 4 gigs of bandwidth each month; all for an easily affordable price (new accounts back then were about $48 per year). (I have since changed hosts for my all my sites, first to Enhanced Hosts for better service and up time; then in 2009 to BurlyHosts.com, for more disc space and larger bandwidth for less money, then a couple months ago (July 2010) to Beachcomber.net -- the offer for the number of domain names and space and price was too irresistable! This page will explain my own experience acquiring these services when I started long ago. As I was very new to this whole thing others in a similar position can have some awareness of what may transpire when they put their own name on the web. I suppose the first thing one needs is "Content" to put on the web. I will assume you already have a web page or site created. If not, here's a page explaining my experience with some helpful aids described. My own used to be a free homepage at GO.com under the name Storypile. Since GO claimed they were "GO"ing out of business, I had to scramble to find a new internet presence. Now you will choose a name for yourself. Your own domain name. You may choose one or many and then check and see if the name has been taken. The site I originally found to do this (and there are bazillions) is 1 Minute Domains.com. The one I currently highly recommend is http://www.gkg.net/ because they are inexpensive and they allow you to park your domain using their server and a "parking page" on which you can put a redirect command forwarding to your existing web site. The other thing is GKG.net allows for a far smoother administration of your domain. Cydian Technologies (who 1 Minute Domains registers through) can get very confusing. Anyway, you use the search function to see if your name is taken in either of three categories, .com; .net; or .org. (That list has now grown a bit.) I started with "aremarkabletime.com" which came from the title page of my GO.com homepage. It was taken! (I now see that it is available!! I swear it was taken last month when I checked, I promise! Really!) Run a few names through the search and you will quickly find how many of the common phrases are already taken! You may have to try a number of variations of your name or phrase to find one that's not used. I made lists of names that sounded OK to me but nothing remarkable. I checked out johnschneider.com and went to his web site--the Dukes of Hazard guy. jjschneider.com was taken by a guy named John J. Schneider, a home builder. So I bought johnjschneider.com since it was available and I couldn't think of anything else. Then after that transaction I did think of something else! Oh well! You can also use one of the other domain classes like .net or .org. Dot Com is the most common and recognizable but most people agree that it matters not if you aren't a "network" or an "organization," you can choose and use any of these that your heart desires. Once you find a name that you like and it is available, you complete the transaction. With 1 Minute Domains that means just stepping through the next few pages where you purchase the domain and pay for it with a credit card. A two year minimum is standard. The form may or may not also include an option to use their service to "host" the domain. This is not necessary at this point unless you have decided that this particular host meets your needs. 1 Minute Domains is a full service host with lots of full-blown utilities for use in a commercial venture. I didn't have this need and didn't have the bucks either. It can be expensive, usually around $100 US or more for a year's commitment. I didn't need the commercial aspect and I wanted to pay much less. Anyway, you can complete the transaction to buy your domain and that's the first step. In a short while you will get a confirming email telling you what your domain selection was and what name will be used for credit card billing. You will also get, maybe in a second email, details of your domain for this registrar. 1 Minute Domains uses Cydian Technologies as the registrar and it is with them you would administer your account. I found this whole experience painless and professional. Now that you have a domain name and a host and a web page or pages to share you can upload your page(s) to the host. In my case Worldzone responded virtually immediately to my purchase with all the details I needed to start uploading my web site to their servers via FTP. Webdude (as he is affectionately and legally called) emailed me with all the info I needed, login name and password and all the FTP information required to get to work right away. So you have two entities to deal with, the registrar and the host. At this point you will see in one of the confirming emails from the host what their DNS label is. The registrar automatically used his own (in the hopes that you'd use his hosting service, no doubt) and this is called "parking." Normally a registrar allows free "parking" of a name until you find your own host, so make sure you don't have to pay for this. Anyway, you will note what the host's primary and secondary DNS name is and then go to your registrar's account and change the primary and secondary DNS to the hosts's names. This provides the link between a person looking for your web page and the server where your web page is stored. 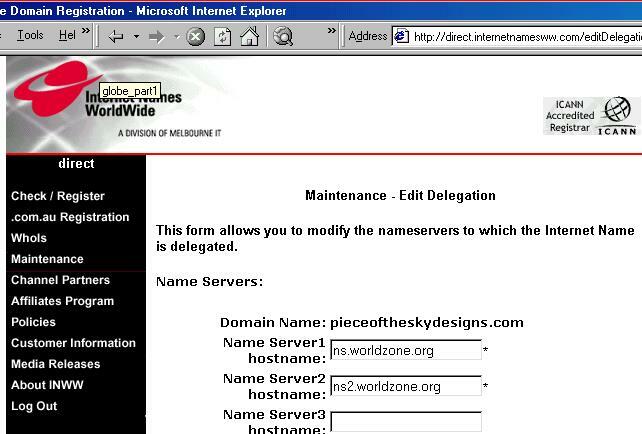 (Worldzone's DNS names are ns.dns4com.net for the primary with this IP address: 216.187.101.27; the secondary DNS is ns2.dns4com.net and the corresponding IP address is 216.187.101.28. For Worldzone's purpose you only use the names not the IP address numbers.) So choose the "Edit delegation details" button and put the host's names in "Name Server1 hostname" and Server2 slots and that's it. I think edited delegation usually takes effect immediately, that is, the new DNS names are available to all the ISPs around the world right away. However ISPs only refresh their DNS lists maybe once a day, maybe every couple or few days! When I made the change to the Worldzone's DNS name it took my ISP (AtHome) 48 hours to refresh their list so that I could access my web site. Lots of other people could see my site before I could! On my first web site I was quite surprised by that and kept pestering the Worldzone.net forums as to what was going on! (Update 3/2009 -- this forum isn't used much anymore, Worldzone is behind the times.) But I now realize it is completely normal. So you just have to try every so often to reach your web site, putting your URL (Uniform Resource Locator) into your web browser's address bar and seeing if your site appears. (You used my URL to find me, http://www.remarkabletimes.com). When this information finally trickles down to your own ISP you are finished! Congratulations! Now you can develop and enjoy your web site to your heart's desire. The real fun begins.